Don't get too excited - although HP's new webbed-up DreamScreens look the part, they're a long way from the portable touchscreen tablet expected from Apple. There are two DreamScreens on offer, with 10.2 or 13.3 inch 800x480-pixel LCD displays. Neither are touch-enabled, although they do have capacitive touch-sensitive buttons mounted in the frame. A remote control allows access to various widgets on the AC-powered device, including Facebook and Snapfish apps. The HP DreamScreens come with 2GB of built-in memory for storing photos, music (not iTunes) and videos (MPEG 1 to 4, H.264) directly on the device. Digital content can be loaded and played using a USB drive or most types of memory cards. 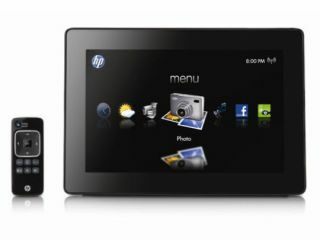 Photos and music can be streamed wirelessly (b/g) or moved to the HP DreamScreen by a simple drag-and-drop from a networked PC with included software. On-board apps include music streaming from Pandora or HP SmartRadio, a new service that aggregates streams of live internet broadcasts from more than 10,000 radio stations around the world. There are small built-in speakers, plus a headphone socket. The Facebook app shows status updates of friends, allows you play a slideshow of your (or your mates') Facebook photos and alerts you to upcoming events. There's also a world clock, multiple alarms (with music or internet radio), weather forecasts and a calendar. No word yet on a Euro launch but the DreamScreens are on sale in the US now, priced $250 (£150) for the 10.2-inch DreamScreen 100 and $300 (£185) for the 13.3 DreamScreen 300.